First, for those who would want one, I made a button. I like buttons. =) I like making them, too. You can find it in my sidebar on the right. Simply copy the code in the text box and paste it into your own blog sidebar. I assume you all know how to do that. If not, just let me know. I like things to be simple and easy. Our lives are all busy enough, right? So here is how this is going to work. The only requirement is you need to have your own book so you will know how to make the blocks. There is a ton of information out on the web on how to use the paper templates or how to make the blocks using foundation paper piecing (which is my plan). We can share information about the resources we have found as we go along. Lets "meet" on the 3rd Thursday of every month to do a show and share of the blocks we have finished. (I don't know how we will meet yet, but will let you all know when I have it figured out.) This should give everyone time to get their fabric choices figured out, buy the book and get some blocks made to show off. If you have any questions, or suggestions, I am all ears. Sounds great! Unfortunately I've got too much on my plate atm to join in, but I will be watching eagerly to see these beautiful quilts develop and grow!! ... you could 'meet' via a linky party?!! I am SO excited. I'll have to put this on my calendar and PLAN on it. I am SOOO tempted to do two. One in CW and one in shabby chic or brights...not sure. DEFINITELY, I want to do this. YEAH! Amy I figured out how to do the button and which 2 blocks will you be doing? Well, first things first, I ordered the book day before yesterday....can't wait to see it!! Can't wait to get started!! Thanks for getting this started!! Thanks for starting this Amy! I will let my friends know so they can follow along or just cheer us on from the sideline. 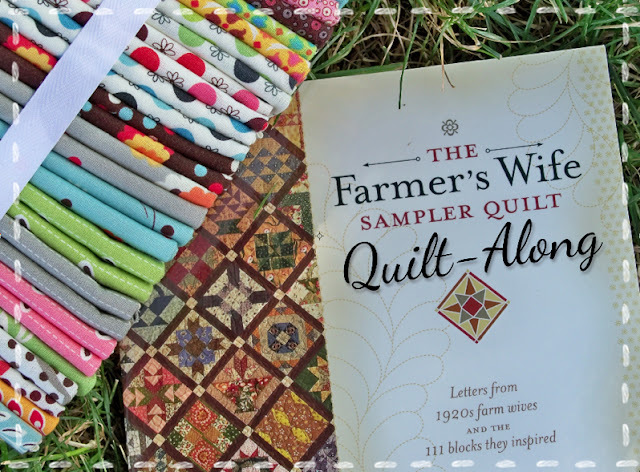 I'm new to your blog and SO excited for this QAL!!! I already bought the book and a Strawberry Fields layer cake to start the Farmer's wife quilt. Alas it sits there. My blog has also sat quiet since last....oh....Sept. This will be the perfect thing to get me going again. :-) Yippee. Question. Will we work on whatever blocks we want to work on or will we have a suggested 2 blocks so we are all pressumably working on the same blocks?